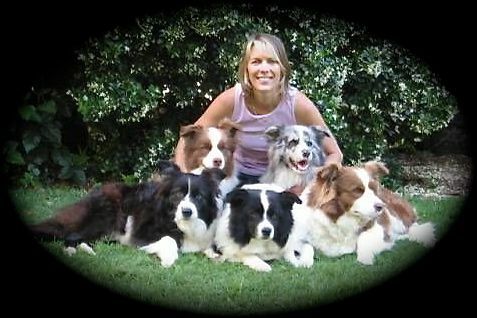 My name is Michelle and I am very proud to be a breeder of these very beautiful dogs. Most are progeny of Australian and New Zealand champions and grand champions. They are impeccably bred, not sacraficing type and temperament for colour. Though I do not show my dogs, they would certainly be an asset to any show home. I pride myself on house raising my puppies. I don't have any kennels. All of my pets are given the love and attention they need and deserve and in a family environment. From birth the puppies are given the special individual care that I believe is necessary for a happy and well balanced puppy. They are lovingly raised with my son DJ and also spend time with my cats. My aim is to breed quality with temperament to fit into a family environment. A puppy that is well adjusted to the comforts of indoors and outdoors and will live happily in an average sized yard. My breeding lines are not highly strung. They are bred from generations of show dogs so they are well suited to a home environment. Because the Border Collie is highly intelligent, they are also perfect for anyone wanting a loyal companion to do both obedience and agility training. We are located half way between Brisbane and the Gold Coast. ALL PUPPIES ARE SOLD ON A LIMITED REGISTER. THIS MEANS THEY CAN NOT BE USED FOR BREEDING PURPOSES.